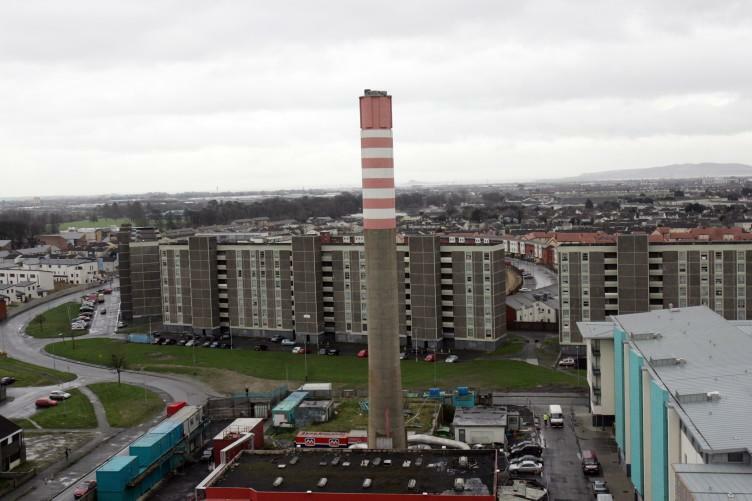 Several years after it was earmarked for demolition, Ballymun’s landmark power station with its highly visible red and white tower is instead set to get a makeover. The boiler house, located in the centre of the north Dublin suburb for decades, has been given €3.6 million from an EU fund to get a green revamp. The boiler house was originally build in the 1960s when the rest of the Ballymun area was constructed to provide low-cost high-rise social housing outside of Dublin city centre. The power station was responsible for providing drinking water, hot water and heating to the 36 flat blocks, as well as some of the public buildings in Ballymun. However it was decommissioned several years ago as part of the regeneration of the area when the water plans for the area were changed, and plans were made to demolish it. Instead, Dublin City Council and a local social enterprise group put together a plan to revamp the building, which will now be retrofitted to allow for classes to take place in it. The Rediscovery Centre, which provides community employment and training in the area, will give education and training programmes in sustainable development in the old boiler house. The work is expected to begin before the end of this year. Dr Sarah Miller of The Rediscovery Centre said the reuse of the building was great news for the area.